← At the Late Hours of My Birthday…! How can you not be moved by this face? The face that says “I’m just like you” but brows speak of an ability to find surprise in the mundane. The mustache says “I may not be perfect, but I try” and the eyes shine the light of a man’s sorrow and a boy’s innocent curiosity. I have always adored Charlie Chaplin for just these things and so much more. The Movies Now Network here in India has been airing Charlie Chaplin movies every Thursday evening this month. I’ve been so grateful and delighted to have been reminded of the artistry and comedic genius of Mr. Chaplin. The man was a remarkable comedian and evokes more belly laughter in a black and white silent film than any in-living-color comedian could hope to master with such ease and grace. But let me get around to the point I’m writing this piece. Last night’s movie was The Great Dictator. Released in October of 1940, this was Chaplin’s first true “talkie” film although he continued making silent films well into a decade where they had left fashion. If you’re not familiar with this flick, it lampoons Hitler and Nazi Germany. 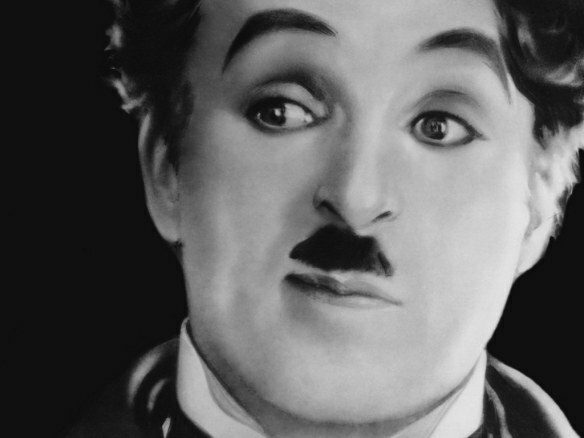 Like all of his films, Chaplin, wrote, directed, produced and starred in its leading role. 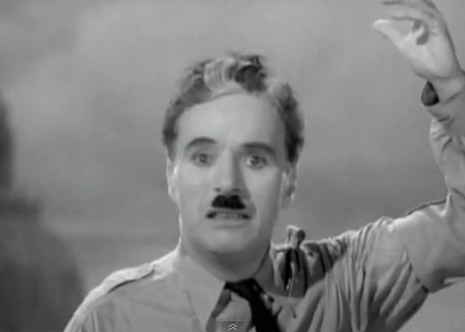 Chaplin plays two characters in this film. One is a Jewish barber and the other is Adenoid Hynkel (his version of Adolph Hitler). If you’d like to know more about the film and its plot,this link should satisfy your curiosity. Although this proved to be his most successful film, I personally didn’t find it had as much whimsy and simplistic depth as his silent films. What did stand out, however, and the reason you’re reading about it on this blog, was a totally unexpected speech at the very end of the movie. Chaplin was a master of those honest and poignant blind-siding moments that never fail to take my breath away and this was one of those. The speech literally reached across the gulf of decades and spoke to real current world issues with both honesty and hope. I was so moved I had to pull it out of yesteryear’s closet in hopes of enforcing the sentiment that the “machine men with machine hearts” never have our best interests in mind in a world where violence and greed seem to be the guiding force of humanity. First, let me set up what has happened to lead our character, the Jewish barber, to the predicament he finds himself in that leads to his speech. He escapes from a concentration camp wearing the enemy’s uniform. Border guards mistake him for Hynkel because they look nearly identical. At the same time, Hynkel falls overboard during a duck-hunting trip and mistaken for the barber and is arrested by his own soldiers. The barber, now secretly assuming Hynkel’s identity is taken to the capital of Osterlich to make a victory speech. He is introduced to the throngs by Minister of the Interior Garbitsch who decries free speech and argues for the subjugation of the Jews. “I’m sorry but I don’t want to be an Emperor, that’s not my business. I don’t want to rule or conquer anyone. I should like to help everyone if possible, Jew, gentile, black man, white. We all want to help one another, human beings are like that. We all want to live by each other’s happiness, not by each other’s misery. We don’t want to hate and despise one another. In this world there is room for everyone and the earth is rich and can provide for everyone. Soldiers: don’t give yourselves to brutes, men who despise you and enslave you, who regiment your lives, tell you what to do, what to think and what to feel, who drill you, diet you, treat you as cattle, as cannon fodder. Don’t give yourselves to these unnatural men, machine men, with machine minds and machine hearts. You are not machines. You are not cattle. You are men. You have the love of humanity in your hearts. You don’t hate, only the unloved hate. Only the unloved and the unnatural. Soldiers: don’t fight for slavery, fight for liberty. You the people have the power, the power to create machines, the power to create happiness. You the people have the power to make life free and beautiful, to make this life a wonderful adventure. Then in the name of democracy let’s use that power, let us all unite. Let us fight for a new world, a decent world that will give men a chance to work, that will give you the future and old age and security. By the promise of these things, brutes have risen to power, but they lie. They do not fulfil their promise, they never will. Dictators free themselves but they enslave the people. Now let us fight to fulfil that promise. Let us fight to free the world, to do away with national barriers, do away with greed, with hate and intolerance. Let us fight for a world of reason, a world where science and progress will lead to all men’s happiness. “Look up! Look up! The clouds are lifting, the sun is breaking through. We are coming out of the darkness into the light. We are coming into a new world. A kind new world where men will rise above their hate and brutality. I hope this moved you as it did me. I hope you will share it with those you think might benefit. Look up, Look up. We must never stop looking up. Thanks for including the speech in a text form as well. Everybody knows about the Holocaust but very few know about similar events nearer home. The military rulers of Pakistan killed 3 million Bengalis in nine months in 1971, which is half as many people as the Fuhrer killed within a much shorter period of time. They would have broken Hitler’s record if India had not intervened. It is natural for that country to extend a helping hand to the Sri Lanka regime in the massacre of Tamils.